There is a lot of anger in Dingle at the moment over the new traffic management plan proposed by Kerry County Council, and I spent half the afternoon in a meeting about it. Basically their idea is to remove all of the street parking from the town centre, restrict car access, and build a new ring road with remote parking lots. It seems the way of the new Ireland to make it more and more difficult to get into, park, and live in town centres, which has the effect of hurting the town but boosting development on the outskirts. We’re rapidly becoming a country of suburban sprawlÂ and shopping malls, but we will try here in Dingle to keep our town intact. Leave Dingle alone, there’s a saying here in the USA….”If it ain’t broke, don’t fix it”. Dingle is a gem, Ireland at it’s best, old but vibrant, busling yet friendly, unpredictable and still very comforting. We in the states are always making changes, mostly to find we were better off before. Give us the traditional Ireland to return to, please. 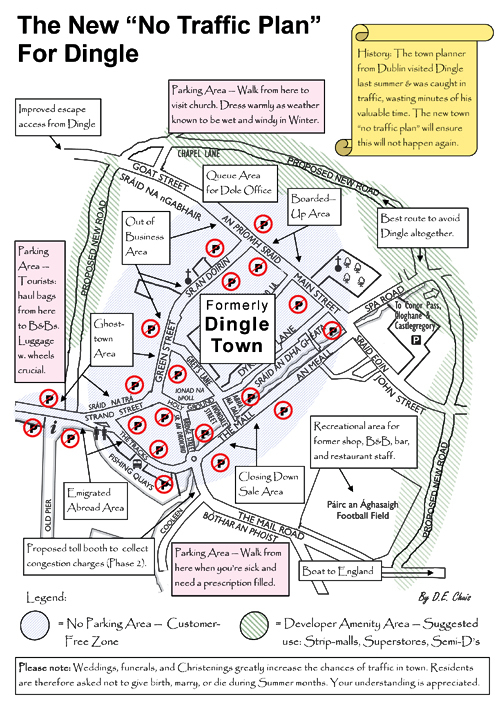 It seems to me that there is somewhat of a conspiracy to hurt the tourism efforts of Dingle. (Can I still say Dingle?) Do you know if this effort is due to an organized effort by any group within Dingle or does this just come from Kerry? When we were there in February we found the town to be somewhat congested, but I canâ€™t imagine having to park outside of town and then walking into town or waiting for a shuttle bus or however else the merchants would try to accommodate this problem. I hope you have a strong business owners organization that can bring some pressure to the council! We will be following this development. Thanks! We’ll do our best to fight it! I guess Americans aren’t the only ones who don’t get the difference between historical preservation and urban planning (i.e., the former is actually possible). Someone in New York City back during the seventies charged that urban planners didn’t actually like cities: what they wanted was to destroy the hustle that IS urban life. Good luck! I hope you don’t do what we did to our cities. Oh. My. God. This is absolutely insane. They may as well turn Dingle into a Disney-fied theme park! Just think: there could be little trollies bringing tourists around to the various shops and uneployed locals could be hired to wear Fungie suits. Hmmm. I wonder how “It’s a Small World After All” would sound sung in Irish. AAARRRGGGHHH!! Has the whole world gone mad?? This is a VERY BAD IDEA! If this happens, I will not return to Dingle, it will have lost it’s character and interesting flavor.